Beer bike, pedal tavern, party bike, pedaling bar, mobile bar, bar on wheels, beer pedal cart, beer pedal car, beer pedal wagon, beer pedal trolley, party trolley, party pedal bus, party pub, trolley pub, mobile pub, etc, etc. Whatever you want to call these things is fine. 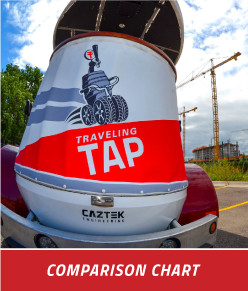 Just remember that Traveling Tap is the luxury version of them all! The best and safest you will find in Minneapolis and The Twin Cities. The NASA engineers that designed and built our bikes had one thing in mind: perfection.